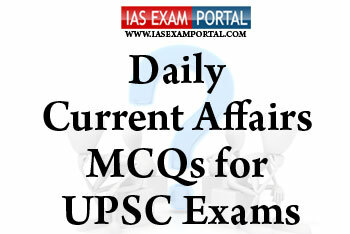 Current Affairs MCQ for UPSC Exams - 28 JANUARY 2019 | IAS EXAM PORTAL - India's Largest Community for UPSC Exam Aspirants. 2) The project is being implemented by GAIL India ltd,which is is India’s No. 1 Integrated Natural Gas company with a market share of over 75% in Natural Gas transmission. 3) It will usher Industrial development in East India by supplying environmentally clean natural gas to fertiliser and power plant, refineries, steel plants and other industries. Q2. Which of the following countries shares international boundary with turkey? 1) The core requirement of a cold wave at the surface is a strong high pressure center that forms during winter in high latitudes. 2) The major reason for this severe weather is absence of western disturbances in the north western part of the country.A western disturbance disrupts the wind patterns in the region and in its absence there will be no significant change in these patterns. Q4. Which of the following statements regarding the ASER report on RTE status & use of basic facilities in schools are true ? 3) The percentage of schools with books, other than textbooks, available rose from 62.6% to 74.2% between 2016-18 . Which of the following is the source of river Chenab ?